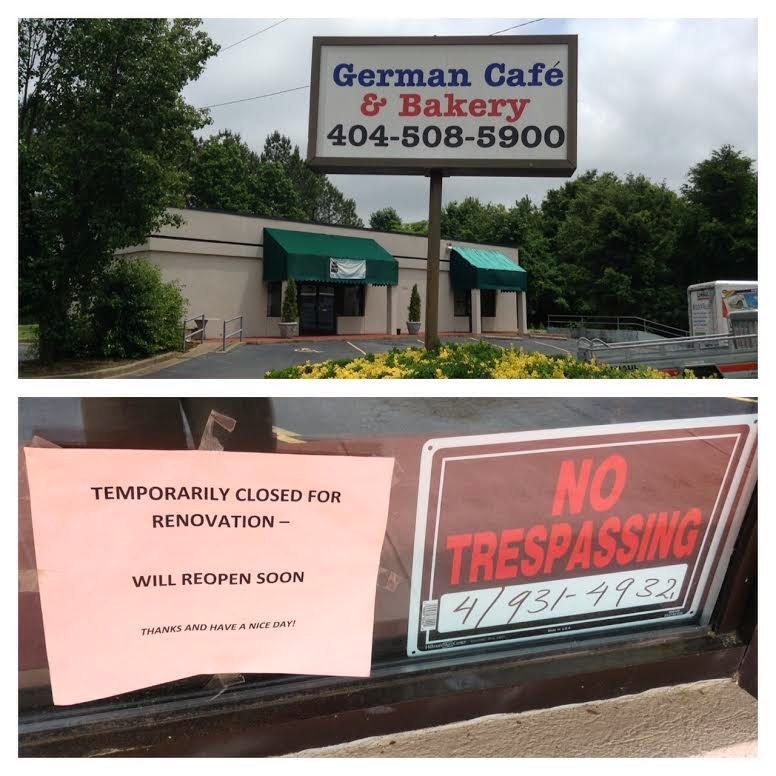 German Cafe & Bakery on White Road, just off Lawrenceville-Highway, has "temporarily closed for renovation." I first heard of the closure a few weeks ago and went by for myself to check it out. The space looks as though it was abandoned with no sign of an imminent reopening. Cafe Ago at Chastain Square will reportedly open in "about two weeks." The casual cafe replaces Cafe Prego. I first announced plans for Cafe Ago last August but work was stalled on the space for months. Orangetheory Fitness will open in a couple months in place of Play it Again Sports at Chastain Square in Buckhead. Play it Again Sports relocated to Buckhead Court. Scenario has seemingly closed at Chastain Square. The "restaurant & lounge" replaced longstanding Chastain eatery and piano bar Chopstix in 2012. Scenario was not exactly welcomed by the neighborhood and seems to have had a quiet closure. Scenario signage on the front door and the building itself has been removed, revealing the old Chopstix signage. When opened, Scenario featured Boneheads food, as the two businesses share the same owner, Ron Barber. In happier Boneheads news, the chain seems to be growing again with new momentum and ambitious expansion plans. Yesterday, Boneheads announced plans to open a new location in Alpharetta on Windward Parkway in August, as well as another in Shreveport, Louisiana in June. The fast grilled fish and seafood eatery also plans to re-enter California via a recently signed 20-unit franchise agreement. The chain reportedly has units coming soon to Texas, Arkansas, New Jersey, Georgia, Louisiana and Mississippi. Boneheads also signed its first franchise abroad, a five unit agreement with a franchise partner in Pakistan. Southbound has finally opened in Chamblee. Mike Plummer and Cooper Miller, previously of Livingston and Dennis Lange, formerly of 5 Seasons Brewing partnered to open the new restaurant. The restaurant has been in the works for over a year and is for now open, but as of now only for lunch. A Southbound representative told me last July they would open "Tuesday" and amazingly enough, yesterday was their first day of business. The recently torn down former home of Piccadilly Cafeteria on Peachtree Boulevard in Chamblee will reportedly be rebuilt as a Kia dealership. The former restaurant had a nice sized parcel, adjacent to Wendy's, but which had sat vacant for months. There is currently only one ITP Kia dealership, Ed Voyles Kia, just north on Peachtree Boulevard. It seems likely that this new location is a replacement of the current Chamblee dealership. A new Panda Express will open in the coming months at Riverside Commons in Macon. The "end cap" restaurant space was previously occupied by a pizza shop. Panda Express will be situated next to Five Guys, not far from a freestanding Chick-fil-A. Smoothie King is getting close to opening its new location at Buford Highway and Clairmont Road. I first announced the smoothie shop's plans to open in place of the shuttered Checker's last August but retrofitting/remodeling of the space took quite a while to begin. Serves Scenario right. What an insult to Atlantans to open that nonsense. I don't see how that is an insult to the population of a whole city. I see this kind of comment a lot. Are the people that delicate? Scenario led their landlords to believe they were a restaurant and then neighbors found Craigs List job ads for Bouncers, go-go dancers, etc. Basically jobs for a night club. This is prohibited by the lease for Publix, so that helped squash the nightclub. I think what anonymous means, is that they tried to sneak into a largely family oriented, residential neighborhood that has vigilant neighborhood associations and got caught. I don't believe Cooper Miller is associated with Southbound. You might want to check with Mike or Dennis. I really hate to hear about German Cafe & Bakery. They had the BEST coconut cake in town!